This astonishing compendium of Burmese country foods is a travel guide as well as a cookbook. Duguid has long experience in South Asia, and has worked hard to translate foodstuffs and measurements into something Western cooks can create in their own homes. She tells stories, too, of where she gets the recipes and how she’s seen ingredients used. She tells of places she’s visited and people she’s met—after a couple hours with this gorgeously photographed book one feels as though one had spent a week away. It is positively transporting. Any aspiring visitor to Burma should have a look at this to get a sense of what one will encounter. Duguid makes one comfortable with local greens, and discusses how, despite Burma’s long coastline, river fish are most prized. Contrary to the expectations of many, not all dishes contain red-hot chilies—often these are condiments that one can add to one’s dish after cooking, along with a series of herbs or pastes, so that one may moderate one’s intake. Interestingly, Duguid explains that Burma may be a vegetarian haven, for many dishes are meatless or can be modified for meatless cooking, using a fermented soybean paste dried into a cracker “tua nao” for flavoring instead of fish sauce or shrimp paste. She introduced me to “Shan Tofu,” a chickpea-flour tofu that she calls “one of the great unsung treasures of Southeast Asia.” Besan, or chickpea flour, is whisked into salted water and heated on a stove until shiny and thick, then poured into a shallow dish to cool. It resembles a cooling polenta in texture, but holds together in soups or salads, and it can be sliced or cubed, eaten plain or fried. I made a brilliant vegan Ma-Po Tofu** with it and I’m going to try it “savory baked” as well. Another intriguing dish I’d like to try immediately is a porridge made of jasmine rice and peanuts which resembles oatmeal but which is spiced with chili oil and blanched greens, fried shallots and crushed roasted peanuts. It is a blank canvas on which to riff one’s highly flavored specialties. Duguid suggests this sauce can be amended to become a sort of white pasta sauce to serve over rice noodles…adding ingredients until one has a meal-sized mixture of food held together with a spiced rice paste. Very intriguing. Every library should have a copy of this book. It is a beautiful, recent introduction to life in Burma and it is indispensable for a traveler. Portsmouth, New Hampshire. December 1774. The Continental Congress of the colonies had recently proposed a boycott on British imports and New Hampshire residents were enforcing it. Committees of Inspection made sure they did. Committees on Communication carried important information between the provinces, and in mid-December 1774, Paul Revere rode to Portsmouth to tell them the cache of gunpowder for use by Massachusetts’ residents had been taken by British soldiers. Thus begins this young adult historical novel, centering on the perspectives of three teen schoolmates at the Latin Grammar School of Portsmouth, New Hampshire. DeMitchell conveys a marvelous sense of place and time, for even today we are able to visit the buildings she speaks of and can immediately connect to the cold and windy weather. Portsmouth is remarkably preserved, as those who have visited the Strawbery Banke Museum can attest. The Town of Portsmouth was named one of the National Trust for Historic Preservation's 2008 Dozen Distinctive Destinations. Best of all, by using the distinct viewpoints of three boys, DeMitchell outlines confusion among the populace about allegiance to the crown or whether residents should unshackle themselves from British rule. Each of the boys must make his own decision about the events that unfold after Revere’s warning, but the historical import of the colonists’ raid of a gunpowder stash in the Newcastle fort is clear to us today. Only four months later, battles in Lexington and Concord are now regarded as the beginning of America’s Revolutionary War. This novel is an aid for young adults (ages 10-16) to understand the complexity of the issues facing residents in pre-revolutionary America. The drama is quite close and clear to the reader, and gives one a strong sense of history. It could be a useful teaching tool in conjunction with a classroom curriculum module and I thrill to think of the fabulous field trips that can be taken in conjunction with studying this period of history. The buildings are relatively close together in Portsmouth and Newcastle (short bus rides), and the atmosphere is old New England braced by sea air. This book is due out January 2013 by Mayhaven Publishing. So, I am not a new vegan, nor is this my first encounter with the extraordinary skills of Ms. Romero. But this is one of the most exciting and completely Braveheart recipe collections I have ever seen. And Romero never left Queens! How is it possible? Romero reimagines classic dishes from cuisines around the world from a vegan viewpoint, something I had almost thought impossible. But she captures the flavor, color, and sense of the original with flair and originality and for the first time I have been able to wholeheartedly enjoy the world’s diverse bounty. I was able to enjoy Pumpkin Kibbe even though I did not have a food processor to grind the pumpkin and bulgur together. I used a 100-year-old hand-crank table-top meat grinder and the result was sublime. I especially enjoyed the Yogurt Cashew sauce, and the recommended very hot chile harissa paste that accompanied the recipe. Both added immeasurably to the authentic taste. One thing I was familiar with in years gone by were Chinese steamed BBQ Char Siu “bao” and I was thrilled to be able to recreate the wondrous experience of eating them again. The recipe is flawless in terms of taste, though I can’t imagine any Chinese person using several pans to prepare the filling. The cornstarch in water can be stirred into the roasted seitan hot from the oven. I get wild cravings for good Ma-Po Tofu and Romero has included a brilliant recipe that works beautifully. I sprinkle on a few toasted Sichuan peppercorns for garnish because its distinct aroma makes the dish taste and smell authentic. I used a new-to-me tofu made from besan, or chick-pea flour. The recipe can be found in Burma:Rivers of Flavor by Naomi Duguid. Romero's Thai dishes are superb as well. The famous Tom Yum soup does not miss it's shrimp and the Grilled Seitan Noodle Salad made me feel quite as though I had just spent the day lounging seaside in the sun. A bottle of organic lime juice does wonders in making the dishes taste authentic. Romero reprised a few of the indipensable Latin dishes she introduced to us in Viva Vegan! : 200 Authentic and Fabulous Recipes for Latin Food Lovers but that book is filled with other wonders you won't want to miss. It is worth it's weight in gold for finding a way to make meat in Latin recipes totally irrelevant and it has recipes North Americans might find closer to home. 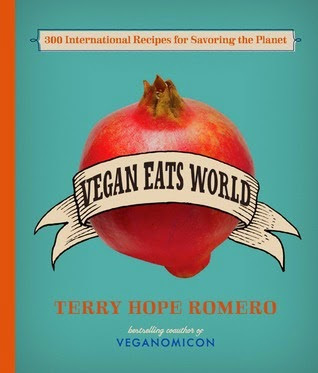 Romero has done aspiring vegans a huge service by providing recipes from around the world. She has added diversity and color, flavor and interest to our menu and these dishes can be served with panache and joy to those curious onlookers to a vegan lifestyle. If you’d ever thought Christmas was a mad, mad time of the year, check out this laugh-out-loud funny story of a twice-divorced mother, Clara, who loves the Christmas spirit so much that she continues to host her two ex-husbands and her former mother-in-law every year along with her own extended family for a wild and merry day. Christmas tradition is sacrosanct and our heroine (what else could we call her?) manages to make especial truffle treats for the vegetarians of the group while satisfying everyone else’s wish for family favorites. She spends more on the people she doesn’t like than the people she does like simply because she puts purchases off longer and doesn’t want to offend. She uses old Christmas decorations along with new, but makes each year a more beautiful and perfect version of the past. If you are exhausted in the rush to make Christmas perfect, take a moment to savor the world created in this novel: the girlfriend secrets, the mother-daughter, mother-son, and sister-sister interactions are all priceless, to say nothing of having one’s ex-mother-in-law to one’s idea of a perfect holiday. All that can go wrong will go wrong, but for the stalwarts among us, Christmas is a state of mind. Ciezadlo makes no bones about it: she is obsessed with food. Food spells happiness, love, and generosity of spirit. Food matters. 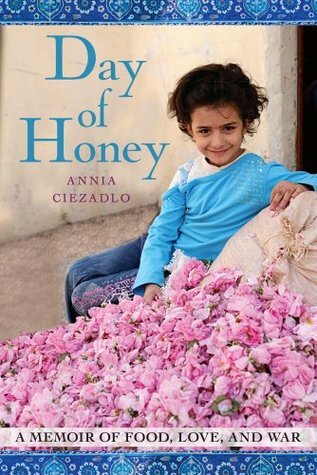 She has a distinctive voice: “dark purple figs, wrinkled and soft as a baby’s balls”; “eggplants like giant obsidian teardrops”; “tomatoes puckered into little baboon butts”; “bananas hanging like spider-bait.” Her exuberance in finding the real heart of Middle East in the kitchens there is infectious and joyous. We long for the sun, the taste of olive oil, the smell of bharaat, the clamorous markets, and the riot of colors. We wish we knew her and hope she will tell us more. A description of her attempts to recreate recipes from basic home cooking is one I will never forget because it happened to me as well. The “simplest” dish of onion, potato and egg can be an utter mystery if one has the proportion, the heat, or the order slightly awry. Ciezadlo’s search for an apartment with a kitchen in Beirut is epic and filled with irony, pathos, and humor. I now have an infinitely better idea of what it means to live in the Middle East. A memoir like this, filled with insight (and recipes! ), is a loving and important introduction to the Middle East. Buy a copy for yourselves and buy one to give one away. 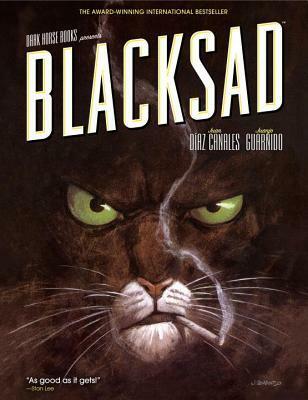 This gorgeous, sumptuous collection of graphic episodes in the life of John Blacksad, Cat Cop, is involving and adult. This is graphic art at a pinnacle of sorts, where the characters are speaking animals who demonstrate both their animal and human natures. The text and the art is loaded with references to familiar cultural touchstones so the meanings are many-layered, often amusing, always fascinating. I am curious that the authors were both born and living in Europe, and yet the stories are American-based. Perhaps the medium, born (?) and developed in the United States, carries so many references in its form that the authors wanted to keep that authentic feel. This is noir, and Canales and Guarnido excel in depicting the gritty streets. The stories are good—always some difficult resolution to a thorny ethical issue--but the drawings are spectacular. I particularly remember a depiction of a street in the shadow of leafy trees, the clear or reflective glass of eyeglasses or skyscrapers, and two people talking in an aquarium--the angle being from inside the tank. But every pane is a miracle of sophisticated artistry that one can marvel over again and again. This is not child’s fare, but for a discriminating adult. 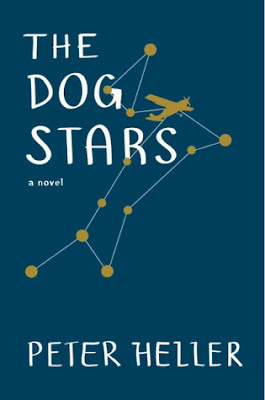 When I first picked up The Dog Stars , I didn’t know anything more than the cover copy gave me: “savagely funny and achingly sad, a breathtaking story about what it means to be human.” Just my cup of tea. A woman at checkout said, “This is considered one of the best books of the year.” I waited for her to say more, to personalize her review, but she didn’t, so I thought I’d be able to tell for myself shortly. Actually, it was definitely one of the best books of my year but it wasn’t because I learned “what it means to be human,” but because Heller told an old-fashioned story in a new way. I could have read on, far past the last pages. The writing was stellar. Tension and restraint braid the narrative and propel the story. Heller took us on a flight in a plane packed with only essentials: he jettisoned anything that didn’t add to the narrative…pronouns, prepositions, even nouns and verbs were flung aside. If less is more, we get just enough to set our imaginations free. I loved it. The setting is post-apocalyptic times. Let me state that this is not my favorite venue. But readers who find might someone else’s vision less than fully imagined, put your reservations aside in this case. This vision is fascinating, but it is the writing that makes the experience. There is a clipped, muscular quality to this narrative that kept me rapt. Heller managed to make even his hard-bitten characters completely absorbing, flawed but generous in unexpected ways. These are characters we care about. And I suppose it is about what humans want and need to thrive. While it’s frightening at times, it is not dreary, not really. It’s a love story. Rosemary Verey was a British garden designer with a distinct style based on historic gardens of old. Her inventiveness was allowed full rein within the constraints of geometric patterns: the outline of the gardens was defined somewhat strictly and marked with box balls and clipped hedges, but within these boundaries a brilliant collection of perennials, shrubs, bulbs and herbs complemented one another and competed for space and gave the impression of an orderly chaos. There was a moment in our [American] recent history when new homeowners and gardeners yearned for just such a profusion of structure, color, and character, and lionized anyone who could help them achieve it. 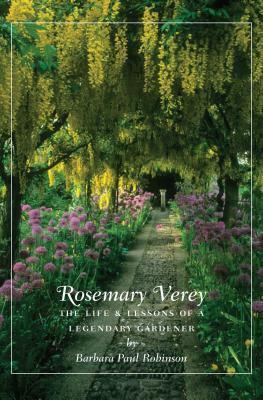 Rosemary Verey was just such a one: a woman of strong opinions, she could teach those interested how to create memorable plant pictures suitable to specific conditions. But we learned as all artists soon do that success is ten percent inspiration and ninety percent perspiration. The labor-intensiveness of her most successful schemes makes one reassess the time commitment after enjoying the fruits of one’s labors for a few years. Fortunately most of Verey’s books were available to me when I began my flirtation with gardening. She enriched my imagination and most of all encouraged boldness and a degree of daring (but no orange). Barbara Paul Robinson, the author of this Verey biography, reminds us of Verey’s oft-repeated remonstrance: “It is a sin to be dull.” Dull Verey was not, and she could evoke strong feelings in most people who touched her life or her work. Verey’s gardens remind me a little of jazz musicians. A great and successful jazz musician (Branford Marsalis?) once said that great art is not completely improvised: it is creating something new within the constraints of an accepted form. I like the idea of constraints, because we all have them, and some do better than others when operating inside of them. And this is so for Verey. The gardens she created will always be lovely, but they won’t have her individual spark of genius without her. Born in 1918, she lived a traditional middle class life until her children left home, and was in her forties when she began creating gardens around the house at Barnsley in the Cotswolds that her husband had inherited as the only son of a long line of clergymen. She began with garden designs unearthed in her historical researches, and began to riff on that, adding a profusion of sometimes new and complementary plants within the formal outline. Verey had an outspoken and outgoing personality that was much prized and admired in America, though perhaps less so in Britain. She had opinions on everything, but her real focus was gardening in a particular style. And that is perhaps why her star has waned. What she brought to us was an obsession and said “you can do it, too.” We liked to think so, but alas, we could not. We hadn’t the time, the army of gardeners, the wealth, the vision, the dogged pertinacity. Robinson the author shows us Verey the woman: whatever her flaws, they are presented within the context of very basic human needs for companionship, closeness, intimacy. This is a fascinating portrait of a woman working within the constraints of her own nature, excelling in some things while doing less well on others. The trajectory of her life gives us material for meditation in our own gardens.